Every year, as a tradition, SensorsTechForum provides you with research in help of you, our readers to try and find the most secure browser. That is no easy task as browser security depends not only by the browser itself, but also on how you use it to surf online and how cybercriminals could exploit browser applications to serve their evil plans. In this article you will find out what to expect from the browser side of things and which browser might suit your needs best. Research shows how third-party scripts exploit browsers? built-in login managers to retrieve and exfiltrate user identifiers without user awareness. tracking scripts еxploit browsers’ built-in password managers to steal usernames and passwords from users, without them finding out. As expected, Google Chrome is still the leading browser in the USA and on an international level, with its 60.59% Global market share. Google as a company continues to make great strides in improving their browser in both aspects of user experience and security. Updates for Google Chrome still arrive at the 15-day mark, but there are even some more frequent hotfixes for all platform types, making the browser reliable in terms of update frequency. Google services successfully blocking .JS attachments (and others) with Gmail and preventing the opening of certain malware sites by showing a notification page are features that are improving with time. In that way, less exploitation methods work, making for a more secure browsing future for users, overall. The sandboxing function in Chrome prevents other threats from getting on your system, if they somehow find a new loophole in the first layer of security. 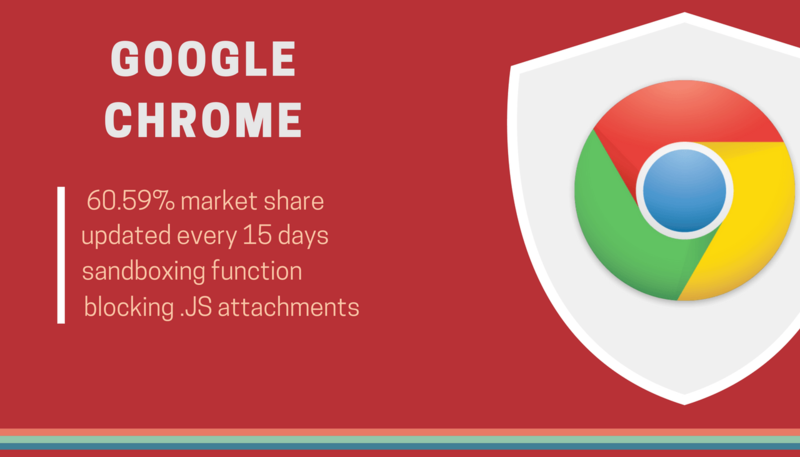 Tweaking of your privacy settings and the large variety of add-ons available at the Chrome Web Store, you can turn Chrome into the security browser of your specific needs. Google invests a lot of capital in security features to keep their browser at the top of the browsing game. The official support for Internet Explorer’s older versions has been cut off since two years ago, leaving the 11th version of the browser, the predominant one that keeps receiving security updates. Thus the browser is used by less people, leaving it with a global market share of 12.18%. Still, even with such a difference between IE and Chrome, Internet Explorer grabs second place it terms of shares. That may be due to the fact that the browser is in-built into the Microsoft’s Operating System, except for Windows 10, making it a preferred choice for some. The update schedule of Internet Explorer remains to be as before – a new update on every 30 days. The updates are scarce and even advertise Windows 10 and Microsoft Edge. 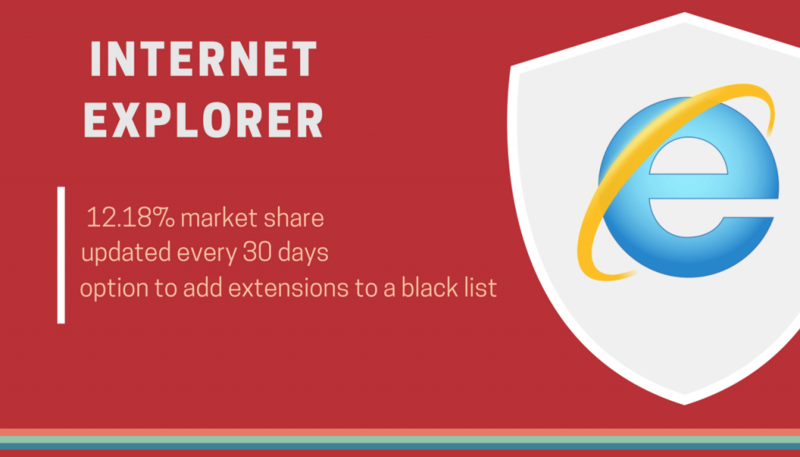 You can add extensions to IE, in order to blacklist sites that are known to be filled with malware, as well as extend your browser security with other extensions. Microsoft has been promoting their operating system, Windows 10 as the most secure and safe system amidst all Windows version. To add to that they claim that Edge is quicker and more secure than its predecessor Internet Explorer. The international market share for Microsoft Edge reveals that there is a decrease since one year ago and now points to 4.39%. Not surprising, since a lot of users were dissatisfied with Windows 10 and moved away from it. Nonetheless, Microsoft keeps updating Edge more frequently than Internet Explorer. 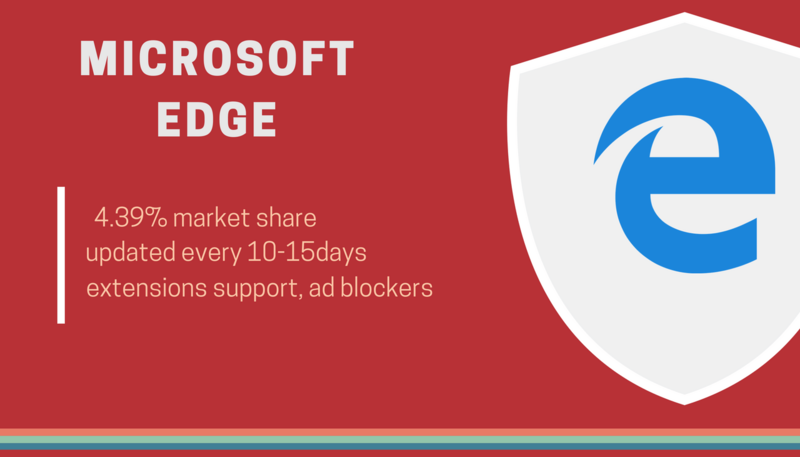 As a result, the Edge browser is updated every 10 to 15 days. The Windows store now offers more extensions you can add to Edge, for example – an ad-blocker to remove pesky adverts and enhance security. InPrivate browsing mode works great if you want to keep information out of your computer, when you are in a browsing session. 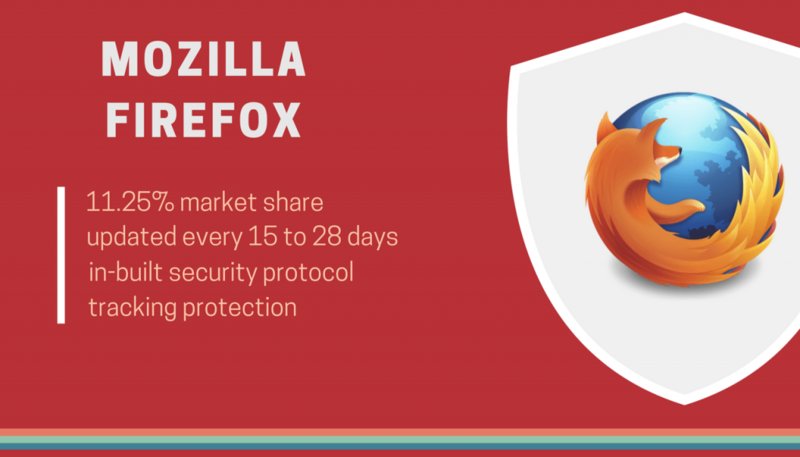 Mozilla Firefox holds third place, same as last year, although its market share has decreased to 11.25%. The Private browsing mode of Mozilla Firefox includes tracking protection. You can install different add-ons on the browser as it doesn’t have in-built ones. Regardless, there are many add-ons to choose from, to suit your privacy needs, including ad-blockers for instance. The update frequency is stated on the official blog of the browser application. New versions are coming out more often than in the past and updates come out every 15 to 28 days. Hot fixes for more important features pop up even sooner than the period written above. Firefox has an in-built protocol related to security, for automatically checking websites for phishing or forgery. Test versions come out daily with the Developer and Nightly versions of the browser. The latest edition to the Firefox browser is Quantum. Firefox Quantum adds a new browser engine, and a cleaner and faster interface. With that said, its security is in a strange position as with the new engine there should be less vulnerabilities, but new ones could be found. Some users still prefer version 56 of the browser since it’s the last version that supports the legacy extensions and feel more secure. However, more and more extensions, such as NoScript already have new versions available for Quantum and people should make the leap as soon as they see their security related extensions updated on the new engine. Quantum and its new engine are bound to get more frequent updates and provide the next level of security to Firefox to all Operating Systems it supports. The preferred browser for plenty Mac users, Safari, holds 3.92% of the World’s market share this year, which is more than it was back at 2017. As the browser is discontinued for Windows, and the fact that most people use other browsers, the low percentage comes as no surprise. Safari’s standard update time period is usually around 54 days. That may stem from the fact that far less vulnerabilities are found in this browser compared to others. Apple Inc. has always been strongly for privacy and security. Having extensions such as DuckDuckGo and 1Password as option to add to the browser comes in handy. Safari continues to maintain a private browsing mode, sandboxing and protection from harmful sites, as well as the feature for blocking third-party cookies. 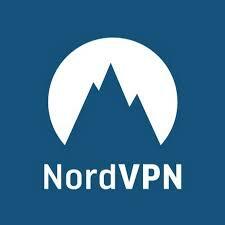 which are the most secure VPNs to make their browsing experience safer. Opera has cleverly included an in-built free VPN service in some versions of its browser just for that purpose. The extensions gallery is filled with new extensions, while offering HTTPS Everywhere, Disconnect, Avira Browser Safety and heaps of AdBlockers. The updates frequency is same as before and a new update is released every 48 days – same as before. Despite that, Opera as a browser does not become the target of many attacks, thus making frequent updates not needed. Opera still offers protection from fraud and malware, blocks content such as malicious scripts or plug-ins, and recognizes them even if they are run on a “trusted” web address. 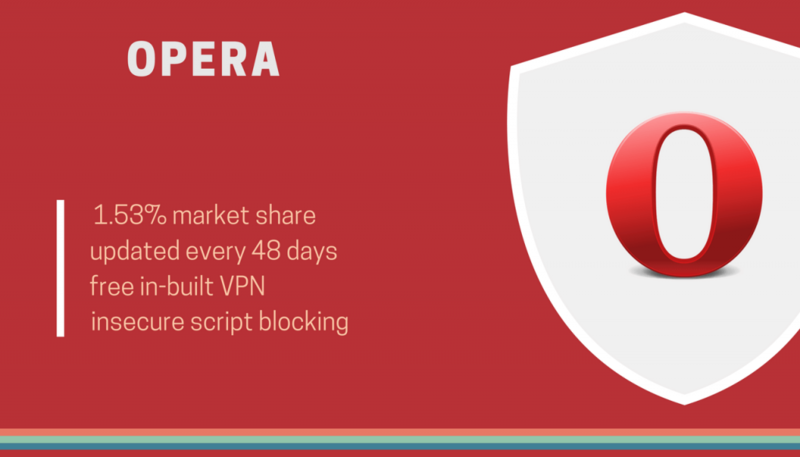 Opera has sold its services back in 2016 to a Chinese consortium of investors, including Qihoo 360 – a internet security company known for its antivirus software. In conclusion, Opera has the tools to make your browsing experience safe and secure with the availability to tweak it in order to serve your needs and a team of 13-year-old security software experts to back it up. The remaining browsers used worldwide hold less than 1.50% of the global market shares. The following browsers are honorable mentions, which still deserve a place in the article. Avira Scout keeps improving and doesn’t miss an update from its 15-day schedule, since its code is based on the Chromium project. Extensions, tools and plugins are all available to make Avira Scout the secure browser you wanted it to be. With the database of Avira Anti-Virus implemented inside the browser, you have another layer of protection against all types of malware threats. Privacy Badger and HTTPS Everywhere are inside the browser’s code. Alas, they are not enabled by default. A huge selection of different ad-blockers is made available as extensions and some can be combined for a more tight seal on advertisements. Avira Scout keeps pursuing its quest to block the tracking features of websites and social networks, such as Facebook. Epic Privacy Browser or Epic for short is browser focused almost entirely on privacy. As the Epic browser is based on Chromium, you can rest assured that its updates will get delivered every 15 days just as the Google Chrome browser. The main goal for the Epic Privacy Browser is to keep extensions to a bare minimum, because many of them usually have tracking capabilities. Epic Privacy Browser, with its innate blocking features, states that even your government cannot track you and no advertisements will be displayed when browsing no matter on which website you are on. These features include the total removal of the DNS and Web caches, blocking URL check and URL tracking, disabling of error reports and the RLZ-Tracking number. Auto-fill options or term suggestions won’t be found available either. And to top it all off, with the Epic Privacy Browser, you will also get its encrypted proxy. That proxy will provide you with real online anonymity, while being available with just one click. Maxthon 5 has brought a lot of stability improvements over the past year, fixing everything from big to small technical issues. The newest version provides an even faster browsing experience, quicker load times and an interface that is light, but visually more pleasing to the eye. No wonder its market share has increased to 0.26% globally and surpassed that of Baidu. The update frequency of Maxthon varies from 3 to 15 days which is more than enough to keep it secure. The browser has been built with rendering engines WebKit and Trident allowing it to open both types of Web pages, while most browsers can read only one of these engine types using HTML5. Maxthon has its own page for installing extensions and still arrives with the AdBlockPlus, ad-blocker application added as an in-built feature. AdBlockPlus developers have officially announced that this will be a long-term commitment and partnership. 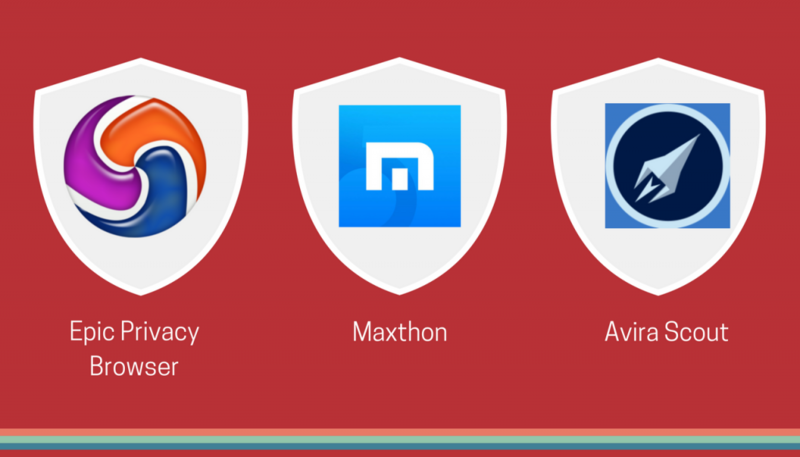 To add to the security control of the Maxthon cloud browser, its cookies and history are both locally stored on every device, so users can quickly and easily wipe clean all related data. The statistics for market shares used in this article have been taken from Net Applications. All of the developers of the aforementioned browser applications keep striving to make their browser as more updated and secure as possible, while putting in new features and ideas behind that goal. Google has surely upped the ante this year, in terms of updates and fixes, and deservingly takes first place in terms of market shares. However, let us not forget that vulnerabilities and exploits keep hitting all of these browsers no matter what they try to accomplish. An essential thing to point out here is that not every browser will update itself automatically, and that you should always keep the browser applications that you are using up to date. You can do a check-up from the following website page. 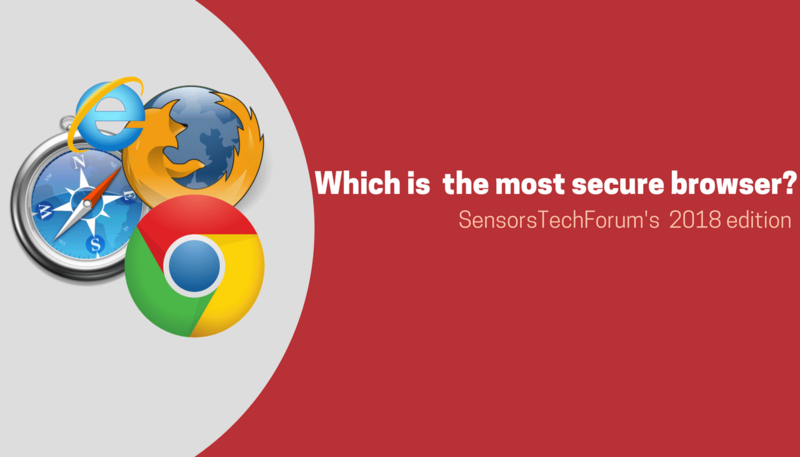 As a bottom line, SensorsTechForum cannot exactly say which of these browsers is the most secure for 2018, neither which one would serve your specific, individual needs. However, you choosing any of the above browsers and trying it out is the best bet of finding that out for yourself. 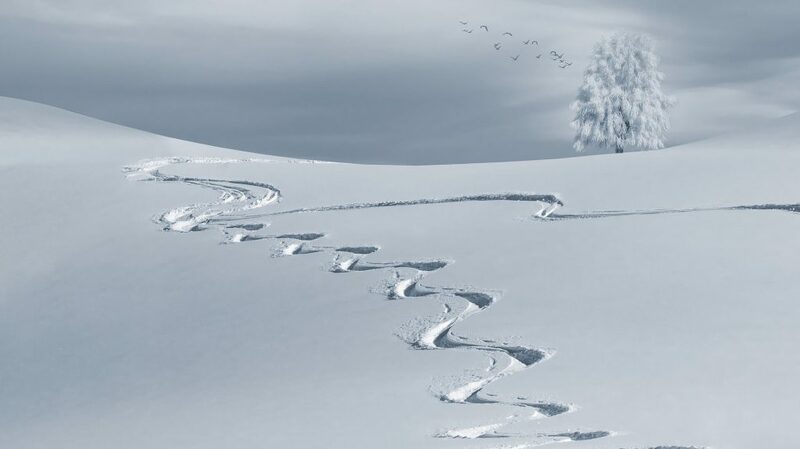 chrome è protetto dal criptojancking,da miner e criptovalute? There are specific browser extensions for Chrome that guard against cryptojacking, such as minerBlock. se llama anti-webminer. Búscalo, lo instalas sin problemas, y permítele actualizar(corregido). What about the Brave browser. Some people that takes security seriously recommend the Brave browser. Another consideration is to use a lower market share browser because of the fact it may be targeted less. Obviously the big target is Chrome and any Chrome like browser. Its more a personal preference these days then one browser is better over another. Depends more on features, a focus on privacy or cross platform abilities. Some even want a lot of extensions to choose from. With so many good options I don’t find any of the choices bad, just different. Hola a todos… doy mi humilde opinión. Que un navegador sea el más vendido NO significa que sea el más seguro y que guarde mejor la privacidad. Por otro lado, que un navegador se actualice muchas veces en poco tiempo con respecto a otros, tampoco significa que sea el que mejor guarde la privacidad y sea el más seguro. Puede ser que un navegador se actualice menos veces que otro pero cada vez que venga una actualización “avance” más que el que se actualiza muchas veces. También puede ocurrir que el que menos veces se actualiza sea porque ya incluya parches que otros lo tengan que poner. Esto pudiera parecer un trabalenguas, pero si se lee detenídamente se comprenderá. Con todo esto me refiero principalmente al navegador Firefox. Puedo asegurar y DEMOSTRAR que Firefox SIN instalarle extensiones y sólo modificando parámetros de about:config ES MÁS SEGURO QUE cualquiere otro navegador incluso instalándole extensiones… y lo puedo demostrar. Además abro debate para el que quiera debatirlo. El navegador Tor es el más seguro y privado hasta la fecha en internet, creo que aquí no cabe discusión, por lo tanto, ¿porqué creen ustedes que Tor está basado en Firefox?… ¿por capricho?… ¿porque al desarrollador le resultaba menos costoso?… pues no, por nada de eso. Tor no es más que Firefox con algunas modificaciones… ¡¡sin más !! !… modificaciones que en otro navegador (el que sea), al menos hasta el momento, no se pueden hacer porque no son de código abierto, es decir, un proyecto libre, con lo cual no se puede modificar desde sus registros. Brave browser, basado en Chromium, esté quizás por detrás de Firefox en cuanto a seguridad y privacidad, pero no se acerca. Ahora parece que se ha fabricado un Tor basado en Brave browser. El único defecto que le veo a Brave es que “come” CPU y RAM como un condenado, al igual que todos los basados en chromium. Yo lo probé y lo tuve que desinstalar y tengo un i3 con 4 GB de RAM. Hey !, I found this information for you: "Which Is the Most Secure Browser for 2018 – Chrome, Firefox, IE, Edge, Safari?". Here is the website link: https://sensorstechforum.com/the-most-secure-browser-2018-firefox-chrome-internet-explorer-safari/. Thank you.